Can you believe this? There isn't even a Snapchat IPO date set yet, and Snapchat already has a $16 billion valuation. 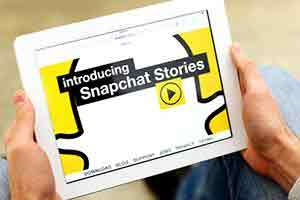 Re/code reported on March 8 that Snapchat may earn between $300 million to $350 million in revenue for 2016. That's a potential 600% increase from the projected $50 million in revenue Snapchat anticipated for 2015. But even though the company is building its revenue ahead of the Snapchat IPO date, there is an established company that has its sights set on Snapchat. Not only is it a big-name tech company, but Money Morning Defense & Tech Specialist Michael A. Robinson sees it climbing another 56% by 2020. You see, this company just made a major purchase that is going to challenge Snapchat's business entirely. When retail investors first hear about an exciting tech IPO, they start to develop FOMO (fear of missing out). Investors who have missed out buying an early position in past IPOs often vow to never miss out on the "next big thing" ever again. But IPOs are not designed to reward retail investors. Only big investors and large institutions make money off of IPOs. A recent example of this was the Square Inc. (NYSE: SQ) IPO. When the Square IPO price was set at $9 per share, it was the big investors and large institutions who were able to buy in at that price. SQ stock opened to the public at $11.20 on Nov. 19, and it closed at $13.07. That was a gain of 16% for retail investors, but a gain of 45.22% for those large institutions. Of course, the excitement quickly vanished. Square stock opened at $8.27 per share on Feb. 9, which means you would have lost 37% in just three months if you bought SQ at its closing price of $13.07 on Nov. 19. The Snapchat IPO will be completely driven by hype. And the truth is, Snapchat isn't even the best at what it does. You see, Facebook Inc. (Nasdaq: FB) is the dominant player in social media and is moving in on Snapchat's core business. Facebook's Instagram finished as the most important social network with 33% of teen's votes. Facebook itself finished as the fourth most important network, bringing in 15% of votes. But combined, 48% of teens felt some platform owned by Facebook was the most important social network to them. On March 8, Facebook announced that it acquired the app Masquerade (MSQRD). MSQRD allows users to create live filters for selfies and replicates the features of Snapchat. According to Business Insider, the Masquerade app had 1.92 million global downloads in January. In February, MSQRD had 7.6 million downloads and is on track for 13.2 million in March. It's on a fast growth projection, and Zuckerberg has proven he knows how to successfully grow his acquisitions. Masquerade will now attract more users, which can help Facebook's ad revenue skyrocket. The more users Facebook has, the more money advertisers are willing to spend to try and reach those people. Exact numbers aren't known, but researchers estimate Instagram could have brought in as much as $750 million in ad revenue in 2015. In terms of total revenue, Facebook brought in $17.93 billion in 2015. That's a 44% increase year over year. Robinson is so bullish on Facebook stock that he placed a $250 price target on Facebook by 2020. "Facebook is nothing short of a mobile juggernaut – the firm is now an advertising and media cash machine," Robinson said. "With upside like that, Facebook is truly a stock that can have a huge impact on your net worth." The Bottom Line: Even though the Snapchat IPO will stir excitement, remember that Snapchat stock will be extremely volatile when it hits the market. Facebook stock is a safer play, and it still offers a 56% upside right now.